Portable fireplaces seem to be becoming really popular. Perhaps it has something to do with snow in Northern NJ in October (ridiculous).Â I know Iâ€™ve mentioned portable fireplaces before, but today I bring you one that is REALLY portable. 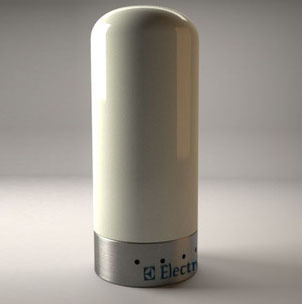 Designed by Camillo Vanacore and made by Electrolux, this has to be the most portable of them all. Wouldnâ€™t you love to put this on the coffee table, while you relax on the couch and watch a movie on a cold winter night? Thereâ€™s more to this fireplaceâ€™s design though than its conveniently small size. 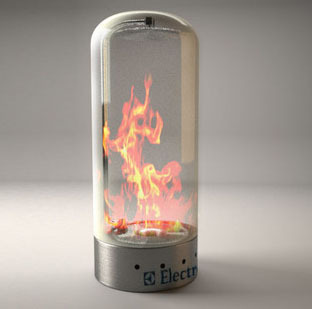 The Electrolux Fireplace actually starts out as opaque ceramic that slowly turns to translucent and then transparent as the flames flare up. When you are done with it and it begins to cool done, the column turns back to white. I would have no idea this second image was even a fireplace â€“ pretty innovative design I must say. ← Would you sit here?